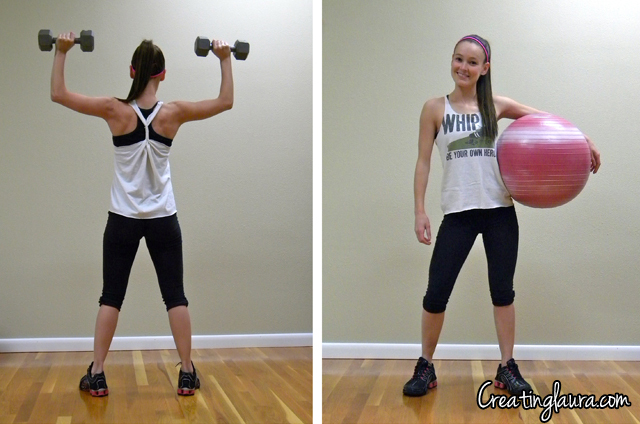 A couple days before I flew down here, I was doing a little blog browsing when I ran across a really cool tutorial for making a cute gym tank top out of an old t-shirt, which is totally perfect for me because I exercise a lot and designer workout gear is anything but cheep. Anyway, I found the tutorial on a really cool site called Blogilates that's full of free pilates videos, tips for healthy eating, cute exercise attire, and general inspiration for living a healthy, active lifestyle. I highly recommend it. I decided to make my tank top out of a t-shirt that I got for free on opening night of the movie "Whip It" that is extremely large on me and, therefore, only acceptable to be worn as an inspirational nightshirt, which is a shame because I really like the message on the front. All I needed to transform this t-shirt was a pair of scissors. 1. Cut off the sleeves of the t-shirt. 2. Cut off the neckline. 3. Cut off the bottom of the shirt, including at least a half inch of fabric above the hem. 4. Cut a v into the back of the neckline, then flip the shirt over and cut a deeper rounded neckline into the front as well, if you would like. This is also a good time to decide how thick you want the shoulder straps to be and re-cut the sleeves accordingly. 5. 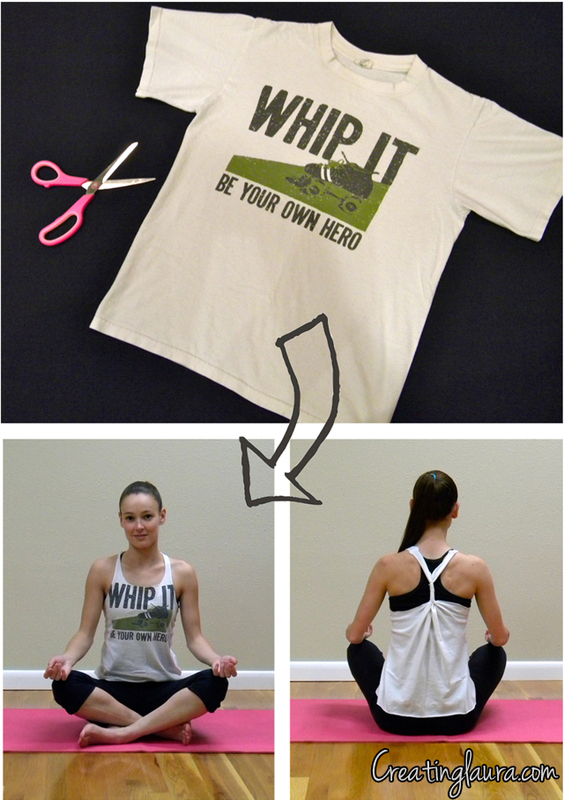 Cut the seams from the strip of fabric that you cut off the bottom of the t-shirt so all you have left is a seamless fabric strip. Stretch that strip out. 6. Tie that strip of fabric in a knot around the straps in the back of the shirt, then wrap the strip around and around the straps and tie another knot at the other end. ¡Está hecho! A new tank top is born! Once I tried mine on, I pulled down on the bottom of the tank and it stretched out the shoulder straps a little bit which made the whole thing the perfect length. Don't forget to check out Blogilates! This is a great idea! And I love the shirt! I am doing this over the weekend. I have an entire box of oversized tees I can't throw away! So cute thanks for the idea! You're welcome, and thanks for reading my blog! Cute idea! Always looking for fun ways to fancy up t-shirts. Thanks so much for sharing this! Now I won't have to do laundry all the time to wear 1 of the 2 workout tanks I have. I can't wait to make tons of these with my husbands old shirts! I've never made videos for my blog before but that's a good idea. Maybe I'll do that in the future. 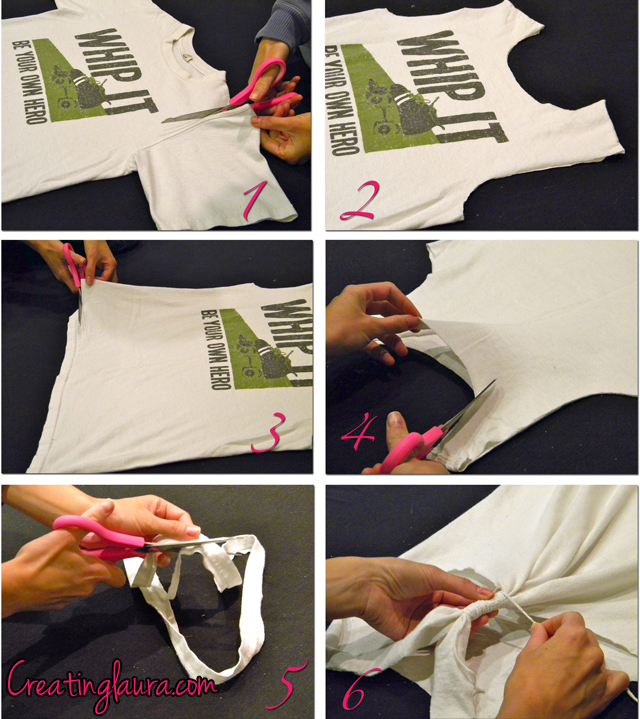 Love this tutorial I have so many old t-shirts I need to do this too! how do you do step 6. like do you knot it at one end and just wrap around one piece and just knot again or do you knot the strip at the middle and wrap both ends of the strip around. Sorry if this is confusing its just so cute and I want to make sure i do it right! also what kind of knot do you tie? i love this idea and im so glad i fond it! Thanx! me too! ive been finding so many ways to style shirts from YouTube but this is the best so far! Knot one end of the strip around both straps of the tank top and then wind the strip around the straps so that the strip spirals down toward the lower back and finish it off with another knot. I tied knots that were similar to an overhand knot or a noose knot. Good luck! wow i love this shirt. This style was 'in' a few years ago, and i never brought the shirts because they were so expensive, but now i can have one without even buying anything! Thanks for sharing. You're welcome! I hope your shirt turns out well. That's so great to hear; I'm glad you like it! Saw this about ten minutes ago and made my shirt just now. It's awesome and easy. Thanks! You're welcome. I'm glad it worked well for you! Amazing project and so easy to do!! Check it out! Found my way here via Pinterest! 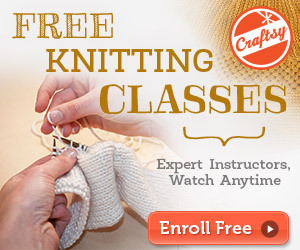 I'm not super crafty, but this is a practical, creative and very doable project! So many shirts, so little use when they're so boxy/baggy. My girls will appreciate this too because they are girly girls who don't take too well to the standard tee. Thanks for this tutorial! I will also check out Blogilates too - sounds good! Oh no, I'm sorry to hear that! Perhaps you can cut your arm holes a little deeper in the back, or perhaps it will just loosen up as you wear it. That problem has never happened to me before, but most of my t-shirts are pretty loose to begin with, so that must leave some room for a little back shrinkage when I'm turning them into tanks. I hope this at least helps a little. I don't understand the "V" cutting in the back. I wanna do this to a t shirt but I don't wanna screw it up. Lay your shirt on the ground with the back facing up. From this angle, the neck hole should look like a half circle. Your goal is to turn that half circle into a V. You can do it by making two diagonal cuts from each side of the neck hole that meet each other a little ways down the back of the shirt. In picture #4 you can see me making that second diagonal cut to meet the first diagonal cut and form a V shaped cutout. Hi Laura, I was wondering if this tank stays the same even after washing. Thanks! Hi! If you've already washed your t-shirt before, it will stay the same after washing; if you've never washed it before, it may shrink. Love it! What part of Mexico are you in? Thanks! I was in Villahermosa. Thank you so much for this idea! I love my new tank top :) It's great for the summer and more of my family members want to try it soon too. Thanks again! 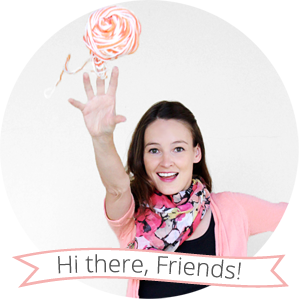 Hi Laura, I love the clean lines of your blog and am also a long time Blogilates/Cassey follower! Your tank top looks great! I like the way you cut the arm holes deeper to show your sports bra.